Let me start by saying that you should buy the Ikon pass immediately and go to Banff, Canada if you’ve never been. A year ago, I had never even heard of it. Banff who? What? Then the owner of our gym got married there and when I saw the photos my jaw dropped. So when a friend asked us if we wanted to go skiing there, my husband and I immediately said yes and booked our tickets! Banff is a destination on the Ikon Pass so it was a no brainer! Banff is in Alberta, Canada and in the summer is full of picturesque lakes and hiking. In the winter it is beautiful frozen lakes and ski slopes! 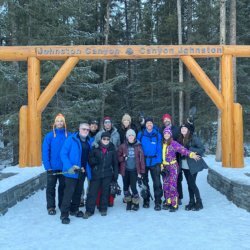 A group of us went this past January and had an absolute blast! 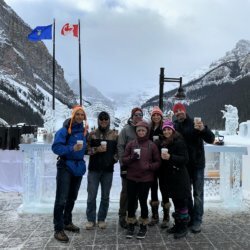 From Canadian Beer to Beavertails to skiing we definitely made the most of Banff. Read on to find out all the places we frequented, different activities, and some hot tips from the locals! IKON PASS Get this ski pass to ski at 38 destinations worldwide (click here to view all destinations). The base pass will run you $650 in advance ($799 after early bird pricing expires). Please note: there are some blackout dates on the base pass (click here to view). If you buy the VIP pass that will run you $949 but there are NO blackout dates. Depending on how much you ski/snowboard, should sway you towards one pass or the other. Click here to view both pass options. WARNING: It will make you want to go skiing because you literally just show the pass and ski right onto the mountain! No waiting in ticket lines and no overpriced lift tickets! Do it!! Exchange rate basically gives you a 25% discount right out of the gate. Australians do all of the grunt work jobs in Banff. 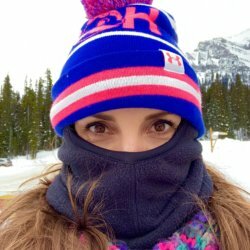 There are tons of Aussies in Banff that basically do all of the jobs that the Canadians don’t want to! Beer is super expensive! 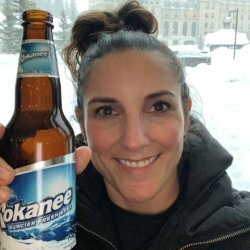 $42 USD for an 18 pack of Kokanee. That is the equivalent of paying $42 USD for an 18 pack of Coors light. Say What?! Banff is COLD but blindingly BEAUTIFUL. There are more people in California than there are in all of Canada! 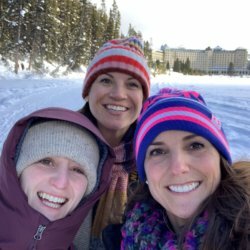 To be able to buy a home in Banff you need to either be born there OR have lived there for 10 years AND make 70% of your income from inside Banff National Park..
Buy Hotronics to keep your feet warm while skiing! 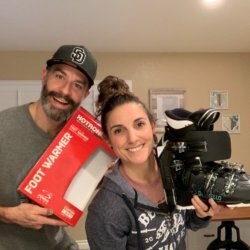 Click here to view my unboxing and installation video and blog! It’s super cold in Banff and these definitely help! Banff Airporter or Brewster Express – This is great transportation to and from the airport. 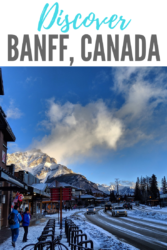 We took the Banff Airporter which takes a bit longer than the Brewster express and does NOT have a round trip discount BUT it has more departure times which made it more convenient for us. They do accept coupon codes so be sure to google that before you pay! Click each name above to see the schedule and rates and which one works best for you! Local bus – There are local bus stops all around Banff. If you show your hotel card when you get on you can ride for FREE! 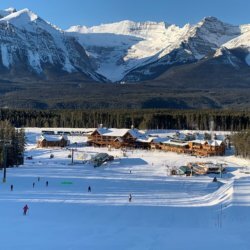 Public Bus – There is also a public bus that you can ride to get to places that are further away like Lake Louise. The fare for this varies but shouldn’t be more than 8 CAD each way. Rental car – There is a rental car place in downtown Banff. Our friends rented one to go to the wolf sanctuary and said the whole process was super easy! 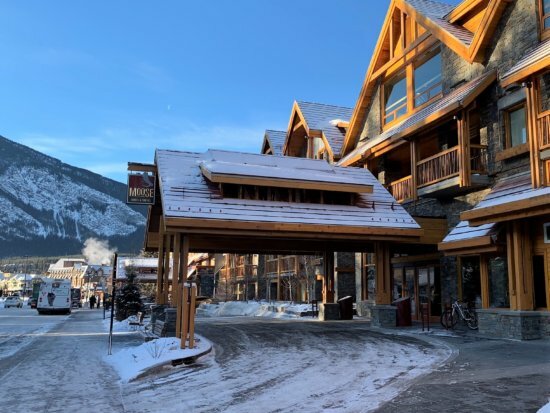 NO UBER or LYFT – unfortunately there is not any Uber or Lyft in Banff, however with all of the modes of transportation listed above, its not really necessary! 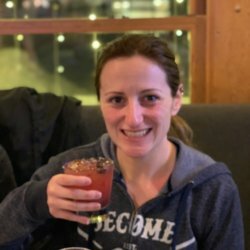 Bear Street Tavern – This place came highly recommended. The pizza was just ok BUT the apps were delicious. We got Mac N Cheese and the Pork Nachos. The big bowl of Sangria was also very tasty. Pizza, meh. The inside is not big so if you plan on going, make reservations! 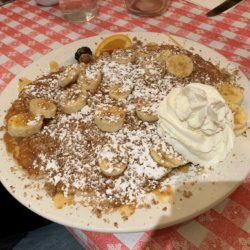 Tooloulous for breakfast -DELICIOUS – We got the banana caramel pancakes with a side of bacon and eggs. Eggs were meh but everything else was FANTASTIC. Get there early because it is a small place and fills up! 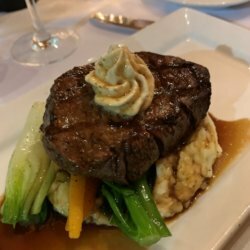 Maple Leaf Grill – If you are looking for a nice dinner out I would suggest Maple Leaf Grill for steak and wine. I got the filet mignon and it was so savory and tender. Other steakhouses that were recommended were Chuck’s & The Bison. 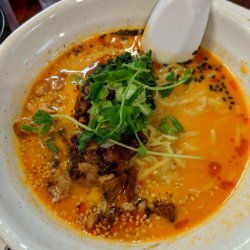 Ramen Arashi in Park Avenue Mall – This was my first time having ramen and I thoroughly enjoyed it! I don’t have much to compare it to so if you are a Ramen connoisseur you’ll have to make your own opinion. Not a fancy place but always packed! 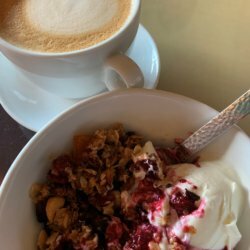 White Bark Cafe – This is located in the Banff Aspen hotel (right next door to our hotel) and the Granola Yogurt bowl is TO DIE FOR. They make their own homemade granola and I seriously couldn’t get enough. Keep in mind I eat my Yogurt parfait (click here to view) everyday but I seriously was in heaven. The granola bowl with a latte. YES PLEASE! Squish Sandwiches – This is a great place to get a sandwich on the go. 15.99 CAD for a sandwich, side and a pickle. We both got the buffalo chicken wrap and our friends got other sandwiches that were also tasty. You can also dine in but we took these to go and ate on the bus to the Johnston Canyon Walk! Beavertails! 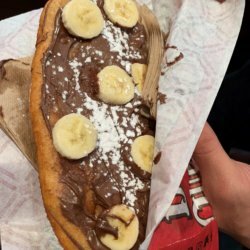 – For any Rhode Islanders reading this, Beavertails are like doughboys (fried dough) topped with your choice of toppings. Anyone who knows me, knows that I LOVE nutella and banana so that is what I got every time. However they have nutella/reeses, white chocolate and oreo and so many more! 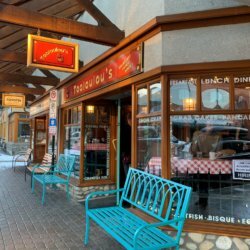 Chocolate Shops – Banff is full of chocolate and candy shops! Pump and Tap – This British Pub is a great little dive bar with big tvs and $10 pitchers (BARGAIN!). Locals call it the hump and slap. Either way I’m game! 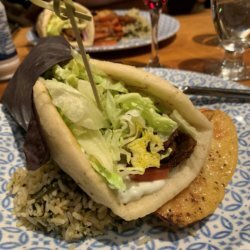 Balkun Greek Restaurant – This is good Greek! Not cheap, but the lamb doner wrap was fantastic. Every Tuesday and Friday they have live music, belly dancing and plate smashing! OPA! 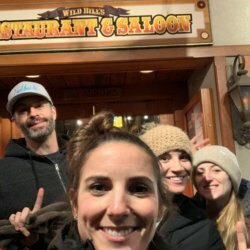 Wild Bills Saloon for beer and live music! 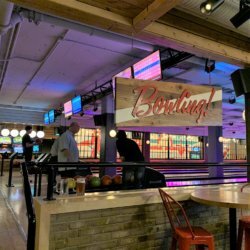 High Rollers Bowling alley – We paid about $11 USD per person to bowl for an hour including shoes. They have daily specials and the pizza here was pretty good! They also have an absurd amount of beers on tap! (and by absurd I mean awesome!) Pretty sure I crushed everyone in bowling! ha! Ice Magic Festival – We got there on the last day of this festival. We bought tickets in advance online and with a coupon code they only cost $5. I wouldn’t say it was worth anymore than that because you could basically see all the sculptures without entering the area. If you do buy a ticket, stop by the Ice bar “inside” and get a spiked hot cocoa! Dog Sledding – Again we booked through Discover Banff Tours and paid about $97 USD for 30 minutes. Be sure to make an appointment. At first I felt bad for the dogs but after some education and actually watching them begging to race I learned how much the owners care and tend to the dogs. It ended up being a cool experience. I suggest going in the afternoon after you walk around Lake Louise for a bit before. 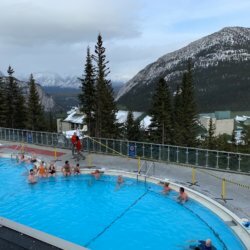 Banff Hot Springs – DONT. It’s just a big hot tub (that looks like a pool) complete with lifeguards. $7 to get in… for what? Not at all what I was picturing. The hot tubs at the Moose Hotel and Suites were amazing with a way better view! Vermilion Lakes – I didn’t go here but two of my friends walked there from downtown Banff and said it was beautiful to just walk around and gaze at nature. I hear you can possibly see the Northern Lights from this lake but unfortunately we didn’t experience that. 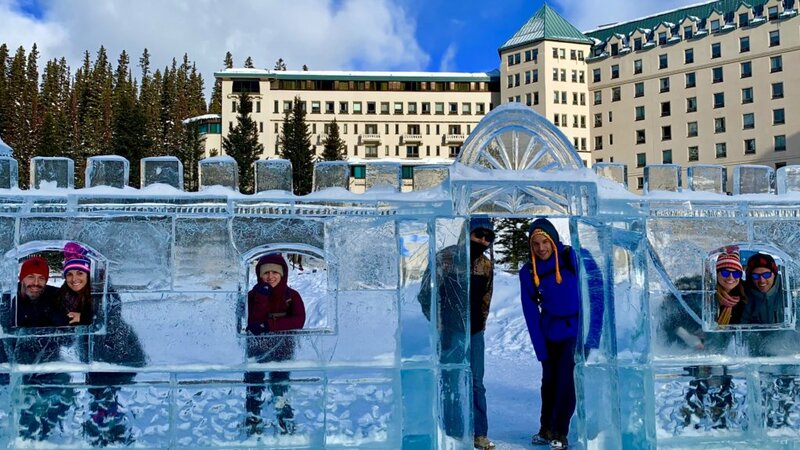 Banff Fairmount hotel – We didn’t go visit but its an iconic landmark. Its heralded as the Castle in the Rockies. Our hotel guy said to go by and just walk around the hotel. 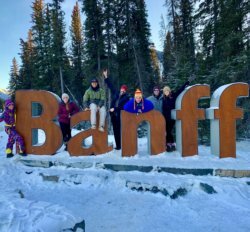 Banff Sign – Cool sign and photo op!